The tools now existed to enable auditors to make Clears—routinely. Although time alone forbade training enough professional auditors to individually clear each person and so achieve planetary clearing, L. Ron Hubbard had already found the solution—Muzzled Auditing. Anyone could deliver the auditing command, provided a professional auditor started, ended and bore full responsibility for every session. And so Mr. Hubbard scheduled the 6th London ACC to teach what he called the newest and most sweeping development in Scientology. And what he laid out is no less than the methodology to clear a planet from how to set up a co‑audit, to case entrance and assessment, and from auditing procedures to administrative lines. In detailing this technology, he stressed its magnitude: “An HAS Co‑audit is what it is. And the only thing that you’d have to add to it is a considerable amount of life, ability to withstand the tremendous confusions that are going to blow off, and carry on with it and bring it through to its end.” And with a fundamental discovery to be revealed at the Theta Clear Congress, yielding the exact process for HAS Co‑audit, L. Ron Hubbard had the technology for planetary salvage. The date was 12 May 1959. 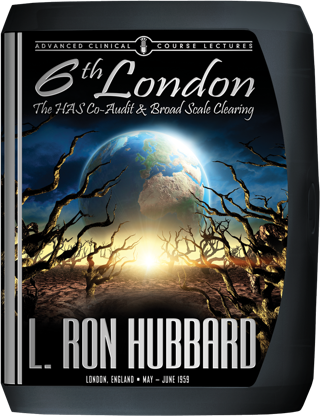 At the Academy of Scientology at 37 Fitzroy Street, London, L. Ron Hubbard was about to deliver to Professional Auditors the definitive Advanced Clinical Course on the subject of how to conduct a HAS Co-audit. To understand the full significance of what was about to unfold, it is a story that begins on another date—9 May 1950, and the publication of Dianetics: The Modern Science of Mental Health. For whereas Mr. Hubbard had always been able to make Clears using Book One techniques—indeed he had been clearing people since 1947—he noticed that the results accomplished by other auditors did not match his own. 2. With an even sharper focus, the development of training procedures to impart the skill necessary so that auditors other than Mr. Hubbard could make Clears. It was a track of research that had yielded a wealth of technology, all standing today as pivotal—Straightwire; Thought, Emotion and Effort; Black and White; SOP; Intensive Procedure; Six Levels of Processing and CCHs, to name just some of the milestones—and all leading to the development of Clear Procedure, which he presented in early 1958. A codification of the processes that he had found most workable in the hands of auditors, Clear Procedure contained an exact series of steps to obtain the state of Clear. And when—in application by a broad spectrum of auditors—Clear after Clear came rolling off, history had literally been made. With further refinement and the development of additional clearing procedures, not only did he now have the tools whereby auditors could crack any case, but, above all, the techniques with which they could be trained to standardly apply these procedures to make Clears—and to make them routinely. Yet, having reached a pinnacle of technical application, there still remained a seemingly insurmountable obstacle. Specifically, time alone made it prohibitive to clear a population of billions by training enough Professional Auditors to deliver one-on-one auditing to every preclear on Earth. 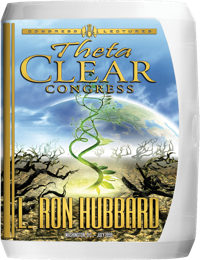 And so, L. Ron Hubbard immediately set forth on the next task—and directly in line with what had always been the goal—planetary clearing. And so it was he scheduled the 6th London Advanced Clinical Course to instruct trained auditors in what he described as the newest and most sweeping development in Scientology. From how to set up a co-audit, to case entrance and assessment, and from determining what process to run, to establishing the administrative lines for an expected flood of pcs, Mr. Hubbard laid it all out. Third Dynamic—when you start bringing order on the First Dynamic, it is also necessary to bring order on the Third Dynamic.